So did I. Gene wanted to take Arky Vaughn’s place. I planned to replace Gene Alley when he retired, but Alley wrecked his throwing arm and hung it up when I was only twelve, so that threw me off my career path. 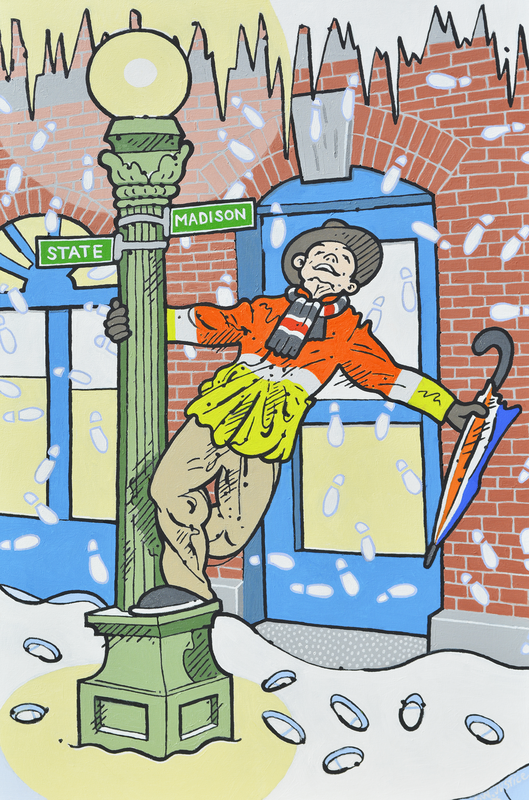 In this commission Gene Kelly is shown singin’ (and dancin’) in the snow at the corner of State and Madison in the Windy City, a week before the Cubs’ home opener. The architecture is brick — Chicagoans learned the hard way years ago that brick doesn’t burn — and the woodwork is painted with surplus Conrail blue. As for his parka, one should dress visibly when dancing in the streets at night. Plus, Chicagoans dress like they might need to change a tire sometime soon. That’s a compliment. Thank me.